BLOOMING GROVE, Pa. -- A late-night ambush outside a state police barracks in Pennsylvania's rural northeastern corner left one trooper dead and another critically wounded, and authorities scoured the densely wooded countryside and beyond on Saturday looking for the shooter or shooters. State Police Commissioner Frank Noonan said a "very dangerous, armed criminal" eluded quick capture. "This attack was an ambush. Our troopers were ... shot without warning and really had no chance to defend themselves," Noonan told reporters Saturday afternoon. "It's a cowardly attack. It's an attack upon all of us in society." The dead lawman was identified as Cpl. Bryon Dickson of Dunmore, a seven-year veteran who had transferred to the region from the Philadelphia barracks several months ago. Trooper Alex Douglass underwent surgery and was in critical but stable condition, Noonan said. Late Saturday morning, a law enforcement official told CBS News that "a person of interest" was being interviewed in connection with the deadly shooting, CBS News senior investigative producer Pat Milton reports. Noonan later said authorities are talking to hundreds of people as part of the investigation. He stressed the man is not a suspect. He provided few details on the shooting but said the attack was directed at state police. Law enforcement installations throughout eastern Pennsylvania were put on high alert. The troopers were ambushed around 10:50 p.m. Friday as one of them was leaving the barracks in Blooming Grove, Pike County, and another was arriving. The barracks is in a wooded area, surrounded by state game lands. 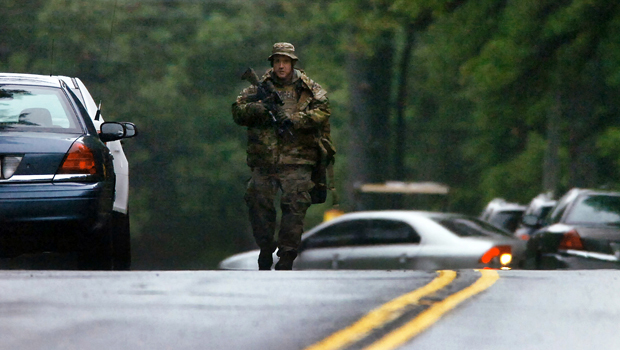 Law enforcement officials from across the region, including New York and New Jersey, descended on the Pocono Mountains to help with the search on foot and by helicopter. "There has been exhaustive search conducted by hundreds of members of law enforcement," said Lt. Colonel George Bivens. "We have canvassed the wooded areas, neighborhoods. We are convinced this individual is no longer in that immediate area." Several roads around the barracks, including parts of Interstate 84, were closed Saturday. Blooming Grove is a township of about 4,000 people about 35 miles east of Scranton.